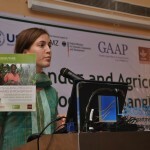 Guest contributors: Chiara Kovarik and Shalini Roy, IFPRI On Wednesday, June 18th, IFPRI hosted a one-day workshop in Dhaka, Bangladesh, entitled “Gender and Agriculture: A Focus on Bangladesh,” attended by more than 90 participants. The workshop included presentations on multi-country agriculture and gender projects, with an emphasis on research results from Bangladesh. A4NH is excited to launch an interactive blog-space on our website that will pick up conversations started at the CRP gender workshop in Nairobi last December.